Overlooking the Matagorda Beach and the Gulf of Mexico! This beautiful house is a step above the rest. 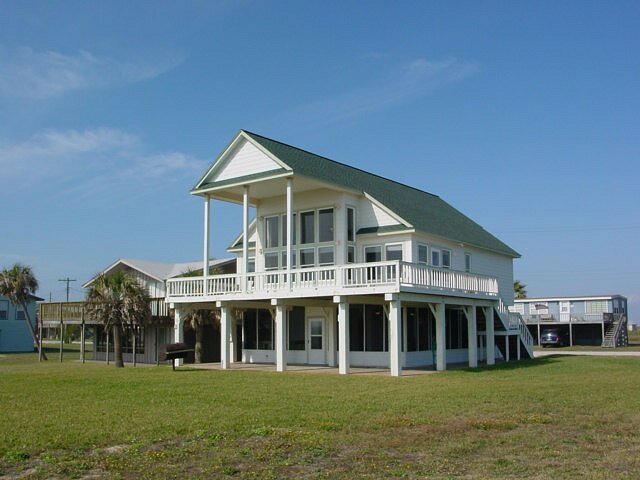 Located on the beach side of Beachfront Drive, this great vacation house is just a few steps over the dunes to the gulf. Recent construction, breathtaking beach front view, 2 story ceilings in living areas and master bedroom. Ammenities include slate kitchen counter tops, microwave, central heat and air, stereo system with both indoor and outdoor speakers, satellite TV, washer and dryer and much more. Screened in downstairs adds even more space. Outdoor shower, bar-b-que grill and more. Sleeps six to eight persons comfortably, not to exceed ten people. Rentors must be 25 years of age or older. Security deposit is $375.00 of which $75 is a non-refundable cleaning charge. NO smoking inside the house and no pets please .